A microscopic study on ancient metals was established to identify chemical composition and microstructure of archaeological tin bronze objects. For this purpose, ten small bronze pieces from Baba Jilan Iron Age site, western Iran, were selected and studied by optical microscopy (OM) and scanning electron microscopy–energy dispersive X-ray spectroscopy (SEM–EDS) methods. The results showed that all objects were made of variable tin containing binary copper-tin alloy. It may be related to the application of an uncontrolled procedure to make bronze alloy. In some samples, lead and arsenic are detected as major elements, but they can be considered rather as impurities from the original ores. Different microstructural features such as elongated Cu–S inclusions as well as Pb globules are visible in the bronze matrix. Based on the metallographic examination, the bronze pieces are shaped by cycles of cold-working and annealing. The microstructure of Baba Jilan bronze objects is similar to other Iron Age bronze artefacts from different regions of Iran. In fact, process of bronze production in the Iron Age of Iran was to produce bronze alloy with different amounts of tin and without any third alloying element, using copper sulphidic or a mixture of copper sulphidic and oxidic ores to smelting copper, and applying working and heat treatment to shape and manufacture thin sheet objects. The study of microstructure in archaeological metal objects is a remarkable and important subject to determine ancient manufacturing techniques in the ancient time. The use of copper and its alloys to make different routine, religious and decorative objects has been common during the prehistoric period. For example, copper has been used in the Iranian Plateau for 9000 years and it has been continued with production of bronze alloy for about 5000 years to make various artefacts [1, 2]. The long time and variety of production and usage of copper and its alloys in the ancient world prove that it is necessary to investigate about different aspects of its metallurgy to identify its various features. Application of bronze alloy to manufacture decorative and religious objects was usual during the Iron Age of Iran (ca 1500–550 BC) [1, 3, 4]. One of the outstanding archaeological findings from the Iron Age of Luristan (western Iran) was different objects deposited in cemeteries and sites . Many of discovered objects from these graves are produced with bronze alloy and are dated to first half of first millennium BC [6, 7]. These so-called Luristan bronzes have been found often in excavated cemeteries (e.g., War Kabud and Bard-i Bal) and, in some cases, sanctuaries (e.g., Sangtarashan and Surkh Dum) . Few bronzes in Luristan region were found during archaeological excavations. Many bronze objects from Luristan in different museums were found during illegal excavations carried out by local people from the late 1920s to now . The technical and archaeometallurgical studies on Luristan bronzes have always been a great interest for archaeologists and scientists. Despite the large scale of bronze objects related to Luristan, there exist a limited number of investigations about technology and metallurgy of bronze objects from this region [8–12]. The archaeological site of Baba Jilan is an Iron Age graveyard that has been surveyed and excavated from 2006 to 2008. It has been located in the west of Lorestan (Luristan) province, near Nurabad city. The graveyard is situated on the flank of the mountain. Eleven tombs, including five jar burials and six cist tombs were excavated in which different burial goods were deposited, such as potteries, bronze and iron objects, stone arrowheads, and decorative objects and ornaments made of agate, shell and bone. The radiocarbon dating done on three bone samples from this site showed a calibrated date of about 800 BC (2707 ± 28, 2784 ± 30 and 2693 ± 31 years). Of course results of dating on another sample showed a different calibrated date of 1538 ± 32 years. Based on archaeological studies and analytical dating, the Baba Jilan site is a typical graveyard belonging to the Iron Age II period (first half of the first millennium BC) with different objects including some bronze objects related to Luristan bronzes . The aim of this research is to provide evidences about the use of tin bronze alloy to produce some grave goods recently found in Baba Jilan site from the Iron Age II period. For this purpose, some small metallic pieces were selected and examined by microscopic and microanalysis methods to characterize microstructural features of ancient bronze artefacts. The importance of this type of research is that only a few excavated bronze objects from Luristan are analyzed till now [10–12], and results of analysis such artefacts can be used as a baseline to compare many looted bronze objects available in different museums for authentication and provenance purposes. To study the microstructure and chemical composition of Baba Jilan bronze artefacts, ten metallic samples from archaeological excavations were selected for experiments (Fig. 1). The samples are different in typology/function and include spout of vessel (BJ-01), shield head pin (BJ-03), small circular plate (BJ-07), small spring (BJ-09), small bead (BJ-11), vessel’s body (BJ-13 and BJ-19), small bead from a necklace (BJ-16), small button (BJ-17) and bracelet (BJ-18). The selected samples were mounted in epoxy resin in room temperature and ground by abrasive silicon carbide papers of 120, 240, 400, 800, 1200, 2000 and 3000 grade respectively. Then, the samples were polished with diamond paste from 3 to 0.5 microns. 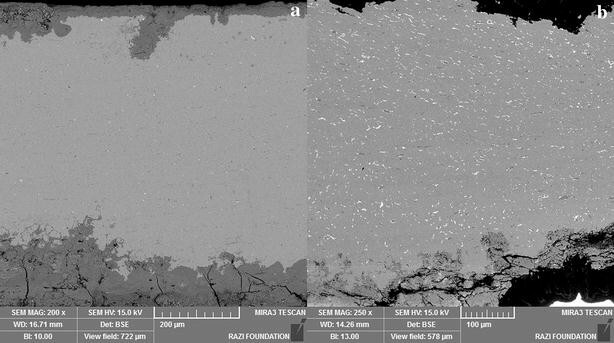 Alloy composition and phases were identified by SEM–EDS (semi-quantitative) on mounted samples in order to observe and analyse details of the microstructure. The SEM–EDS analyses were performed in low vacuum using FE-SEM instrument model MIRA III manufactured by TESCAN Company, with a RONTEC backscattered electron detector (BSE) and an energy dispersive spectrometer (EDS). In addition, microstructures were observed in mounted samples using a polarized light microscope model BK-POL/BKPOLR manufactured by Alltion Company before and after etching by ferric chloride solution in ethanol . SEM–EDS investigation was employed to determine alloy composition in Baba Jilan bronze objects in a semi-quantitative manner. Table 1 shows the results of alloy composition in ten samples carried out by SEM–EDS method. According to Table 1 it is obvious that all ten samples are made of tin bronze alloy. Also, it is clear that the main alloying elements of all samples are Cu and Sn. The percentage of Cu content varies from 82.3 up to 90.2 and the Sn 3.9 up to 14.6. Through these analyses one can observe that the Sn contents show different values. Lead is detected in minor concentrations in samples, only in one case, it has been determined as major amount, 6.95 wt%. Similarly, As, Zn. Fe and S have been detected as minor constituent, despite of a sample that arsenic has been measured in 2.87 wt%. Presence of the As and Pb amount of lower than two wt% may explain that it has entered into the alloy composition as an impurity from copper ores [1, 15, 16]. Also, the Iron Age bronze objects from Iran usually contain minor or trace amounts of lead and arsenic, suggesting its presence might characterize an impurity within the ores smelted [17, 18]. Generally, it is evident that eight samples are made of a binary copper-tin alloy, and in two cases (BJ-16 and BJ-18) leaded bronze and arsenical bronze are used to manufacture metal objects. The variety of tin content proves that the objects have not been made by a particular alloy proportion to reach a homogenous bronze composition such as adding a distinct amount of tin to copper and melting them, but an uncontrolled process is used to produce tin bronze alloy, such as co-smelting, cementation, recycling or smelting copper-tin containing ores [3, 12, 19, 20]. The variability of tin content is commonplace in the study of the Iron Age bronze objects of Iran, especially in Luristan bronzes. Results of analysis of different bronze objects from Luristan show that there was no specified procedure to control the alloy composition in the manufactured bronzes in that time [8, 10, 12]. Nevertheless, each of the processes may have been used for the bronze production in these Iron Age bronze artefacts. On the other hand, presence of considerable amount of lead and arsenic in one sample each state that either these samples are made deliberately to produce ternary alloys or these may not be added as alloying elements deliberately but may be entered the alloy during ore smelting. Regarding to composition of previously analysed bronze objects from the Iron Age of Iran (especially Luristan), the binary Cu–Sn alloy has been the commonplace event in copper alloys production and no deliberately ternary Cu–Sn–As or Cu–Sn–Pb alloys have been used to make metal objects [8, 10–12]. Nevertheless, these ternary bronzes are considerable due to their composition. Mounted samples of all objects were examined under the optical and SEM microscope. SEM–BSE and OM micrographs of bronze samples before etching show a metallic matrix with numerous scattered inclusions in it (Figs. 2, 3). Many of these inclusions appear as a grey-green colour in OM observations (Fig. 3). These are elongated in the latitude of the cross section. On the other hand, some very fine, globular bright inclusions are visible in the matrix in SEM–BSE micrographs (Fig. 2). To identify the chemical composition, some elongated and globular inclusions were analysed by SEM–EDS microanalysis (Fig. 4). The results showed that the grey–green elongated inclusions are composed of copper and sulphur with a low content of iron. Tin and zinc are detected as major components in some inclusions, while they are determined in others as minor elements together with arsenic. According to the EDS results, it is obvious that the dark elongated inclusions are copper sulphide compounds (Table 2). The smelting of sulphidic or sulphidic/oxidic ores has been long done in ancient time to produce metallic copper [21, 22]. It should be noted that many copper ore deposits used in the ancient Iran were weathered copper sulphide ores, consisting of copper sulphide and oxide compounds . Due to smelting such ores, Cu–S inclusions are often observed in Iron Age bronze objects from Iran. In fact, some copper sulphide didn’t transform to metallic copper during the smelting and will be evident as grey-green inclusions in the bronze microstructure. It should be noted that these Cu–S inclusions are observed in many copper and bronze objects from the Bronze Age to the Iron Age of western and northern Iran [8, 12, 20, 23]. Presence of low amount of iron is most probably due to the presence of iron in smelted copper ore, in the form of iron sulphides or use of an iron–copper sulphide such as chalcopyrite . Further, any light inclusions of small dimensions were also visible scattered in the bronze matrix in SEM–BSE micrographs. EDS analyses conducted on five white globules showed that they are Pb-rich metallic compounds containing about 60–90 wt% of lead (Table 2). Theoretically, the chemical composition of these globules must be nearly a 100 % of Pb, but the presence of some copper (and tin) in composition these inclusions might be due to influences from the surrounding bronze matrix in the EDS microanalysis. Based on the Cu–Pb binary system , lead is immiscible in copper and appears as fine or large separated lead rich phases scattered in the microstructure of copper alloys. The number and size of these lead globules are strongly related to the amount of lead. For example, in sample BJ-16, lead has detected more than 6 wt% (Table 1) and the number of white phases is much more than other samples in its SEM–BSE micrograph (Fig. 2b). Also, a metallographic sample of each bronze object was taken and examined under the optical microscope. 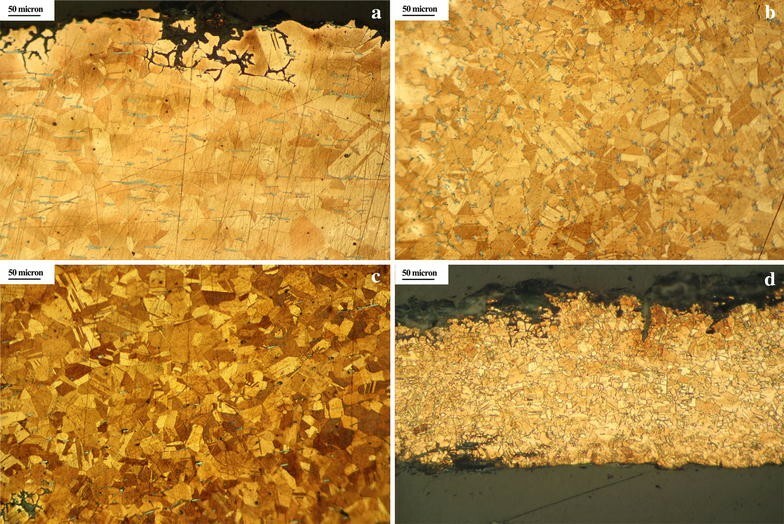 As noted above, optical microscopy (OM) micrographs of bronze samples before etching show an alpha solid solution matrix with numerous scattered dark grey-green inclusions in the matrix that are elongated in the latitude of the cross section (Fig. 3). To reveal grains’ microstructure and the manufacturing process, samples were etched in an alcoholic FeCl3 solution. After etching, the microstructure of the samples showed a typical grain structure consisting on deformed and recrystallized grains of copper–tin solid solution with twinned and strain lines within some grains. Samples with straight twin lines also do not show strain lines (Fig. 5). This type of microstructure is common in archaeological bronze objects. In fact, the metallographic features of these bronzes state that all objects are manufactured and shaped during a cycle of cold working and heat treatment. This is apparent from equi-axed and recrystallized grains [14, 24]. Cold working on copper alloys leads to strain-hardening: the grains are deformed and become increasingly flattened until they are too brittle to deform any further. At this point, the grains are fully work-hardened [14, 25, 26]. For further shaping by hammering, it requires to anneal the metal in order to restore malleability. If more shaping with hammering is operated, then annealing may be needed again. Thus, many bronze objects are made by several cycles of cold working and annealing to reach the final shape. The variable grain sizes imply (i) Different amount of deformation; (ii) Different annealing conditions and/or different numbers of thermomechanical cycles . Based on the results, the main metalworking processes to manufacture Iron Age bronzes from Baba Jilan produce binary Cu–Sn alloys. Some elements are detected as major content in alloy composition such as Pb and As, but they may be high amount impurities that are entered to the alloy from used ores and can’t be considered as deliberate additions to the Cu–Sn alloys. The microstructure of samples includes the matrix of alpha solid solution with copper sulphide inclusions and lead globules. These appear as segregated phases in the solid solution, due to their low miscibility in molten copper. In some samples, the Cu–S inclusions are elongated due to mechanical operations used to shape these fine objects. Metallographic study of these bronzes showed that cycles of mechanical operation and subsequent heat treatment have been applied to shape and transform original bronze ingots to final objects. This was proved by the presence of worked and recrystallized grains of alpha solid solution in etched microstructure as well as elongated sulphidic inclusions scattered in the matrix. Further, grain size is different in bronze samples; this implies a variety in degree of deformation used to shape the bronze objects by different times of the working-heating cycle. Bronze production with an uncontrolled smelting/alloying process, the product may be bronze prill with high amount of other elements such as Pb or As. Using bronze prill to make very small objects or melt several prills to produce bronze ingots. Using ingots for casting large sheets/pieces of bronze (optional) or cold working on sheets or pieces to shape the objects. Annealing of work-hardened pieces to return workability. Continuous thermo-mechanical process to reach the final shape of the objects. Microstructural study on some bronze objects discovered from the Baba Jilan Iron Age site in western Iran was carried out by microscopy and microanalysis methods to identify their manufacturing processes. Results of analysis of ten objects showed that all were manufactured with a variable composition of tin bronze alloy with some elements accidentally entered in the composition such as lead and arsenic. It proved that the bronze production may have been performed by an uncontrolled production method, such as co-smelting or cementation. It has been observed in many bronze objects from the Iron Age of Iran, especially Luristan. Other elements such as Pb and As are present in the composition that may accidentally derive from the original ores. Also, the microstructure of bronze objects shows the application of thermo-mechanical operation, including cold working and subsequent annealing as a cyclic procedure to transform a bronze ingot/prill to some fine objects. Based on the metallographic observations, bronze objects showed similar grain microstructures, including worked and annealed grains with twin lines. In fact, based on the results, the application of microscopic and microanalysis methods can help to understand manufacturing techniques and characteristics of archaeological bronze artefacts. OO performed the analytical work and OM observations and prepared the manuscript. AH is the archaeologist that documented the excavated objects, helped to draft the manuscript and participated in the research design. Both authors read and approved the final manuscript. The authors are thankful to Behnam Rahmani and Nazanin Nikroo, SEM laboratory of RASF, Tehran for their helps to carry out SEM–EDS analyses and Siamak Makhzani, IAU, Hamedan Branch, for editing the final text. The experimental and technical work presented in this paper has been carried out within the framework of research project no. 939/10, financed by the Research Office of the Art University of Isfahan, Iran in 2015. Overlaet B. Luristan bronzes: I. The field research. In: Yarshater E, editor. Encyclopaedia Iranica online, Originally published: November 15, 2006. Available at http://www.iranica.com/articles/luristan-bronzes-i-the-field-research.